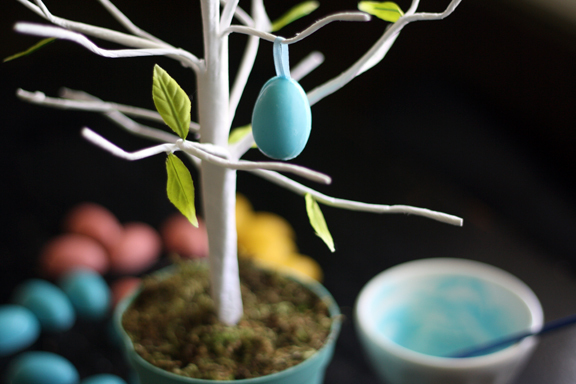 Adorable edible Easter egg tree. Say that three times fast. Easter is less than a week away…are you ready? I’m still hopping around tying up loose ends and trying to get all of my eggs in one basket. HA! Couldn’t resist. 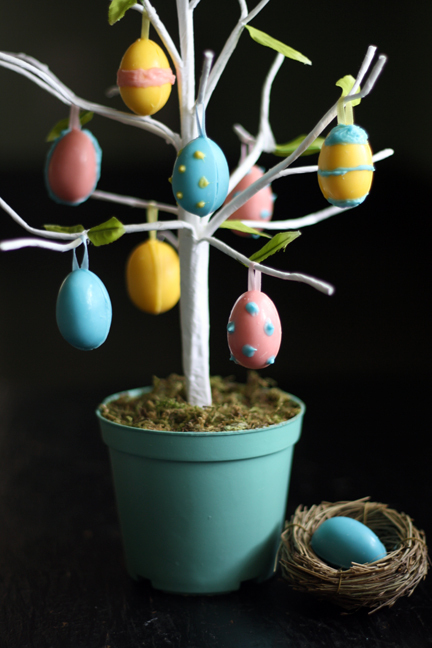 This year in preparation of the holiday, I’ve made an edible Easter egg tree adorned with delicious white chocolate eggs! 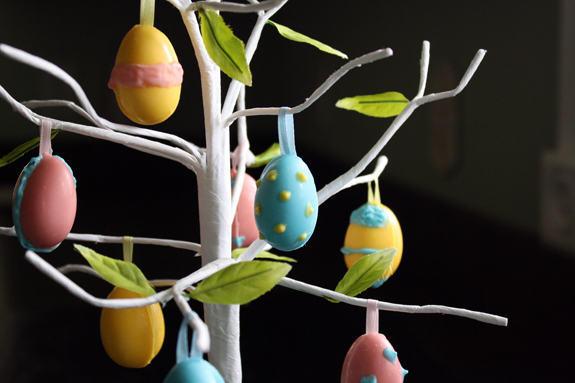 It was so fun and easy and can be used as a festive decoration in or as a center piece for your Easter table. 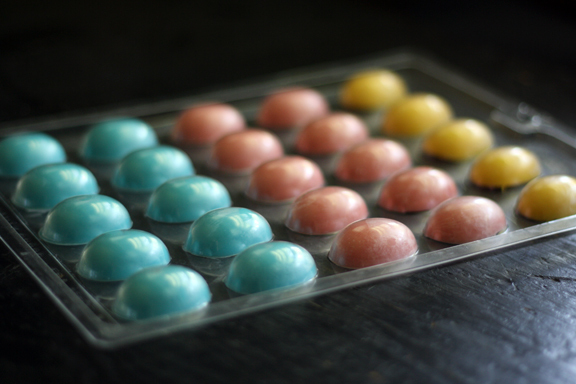 Just gather some pretty pastel candy melts. 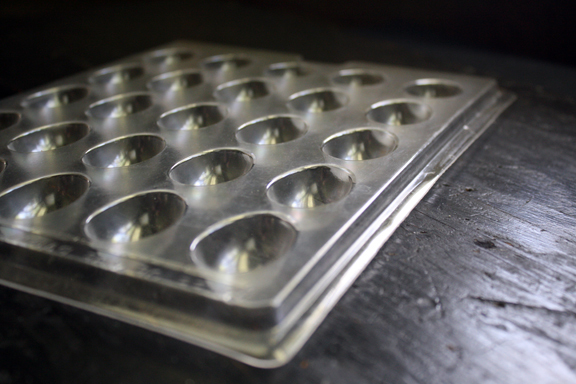 An egg shaped plastic candy making tray. 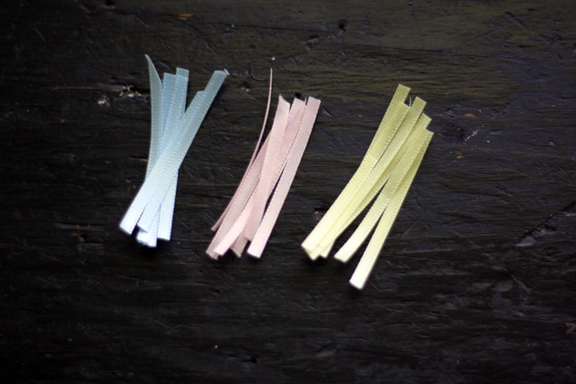 And some thin ribbon that matches the pastel color candy melts. All of these items are very affordable and can be found in your local craft store. 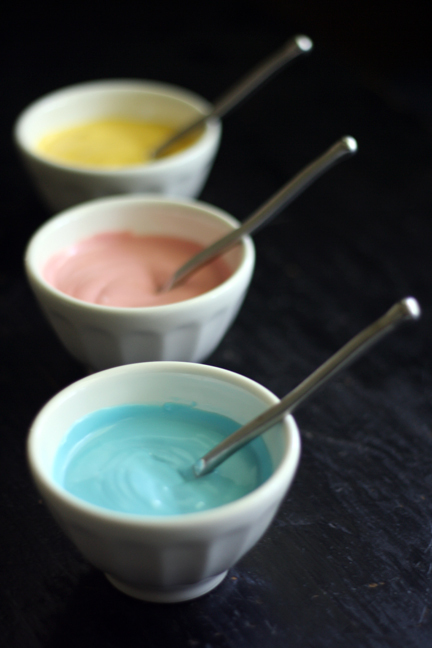 Grab a small spoon for each color and give a good stir to make sure that the chocolate is lump free and smooth. Next use the little spoons to fill the plastic tray with the melted chocolate. 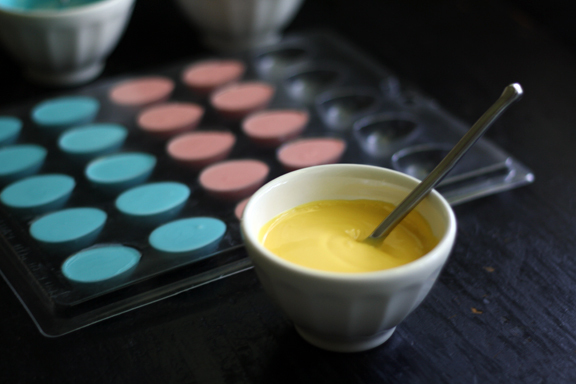 Try as best you can to fill the egg shapes evenly and don’t fill too much. Once the tray is full, give it a good, tap, tap, tap, by picking up a corner a dropping it on the counter. This will get rid of all air bubbles that may be lurking about. 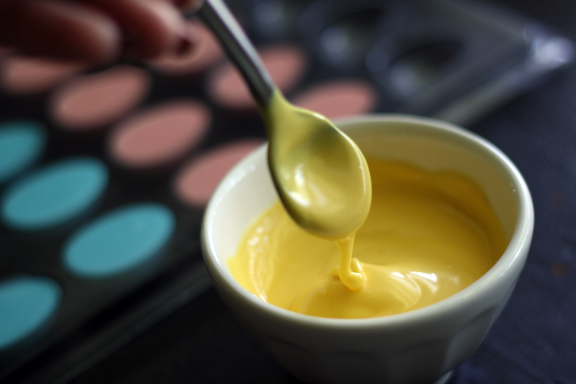 We don’t want air bubbles…we want smooth Easter-eggish-eggs. Once your tray is filled and tap, tap, tapped, pop it in the freezer (laying flat) for five minutes. The freezer sets the melted chocolate beautifully and gives the finished product a nice shine. 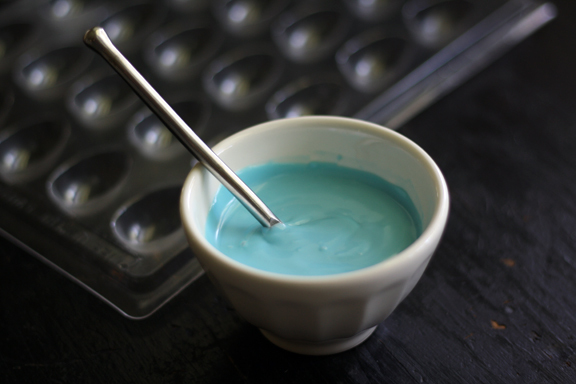 After five minutes, take the tray out of the freezer and turn it up-side-down. The eggs should pop out easily, if they don’t just put them back in freezer for a few more minutes and try again. 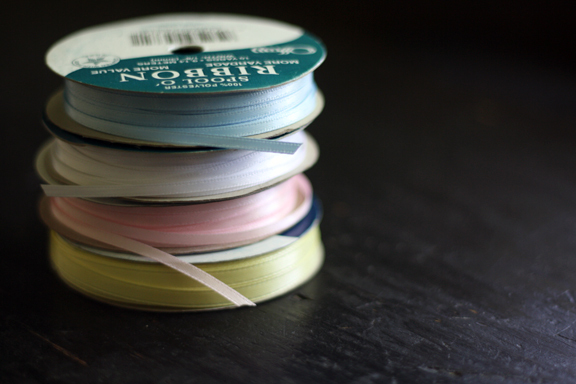 Next, cut your ribbon into two inch strips. These will become the loops from which the darling little eggs will hang. Now the fun begins. 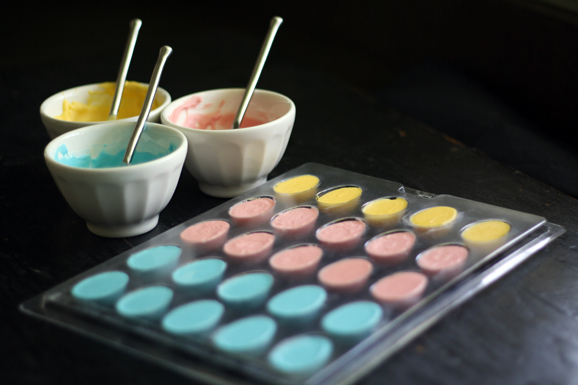 Warm up your candy melts (I’m guessing that by now they’ve gotten cold and hard like mine did) and grab some paint brushes. 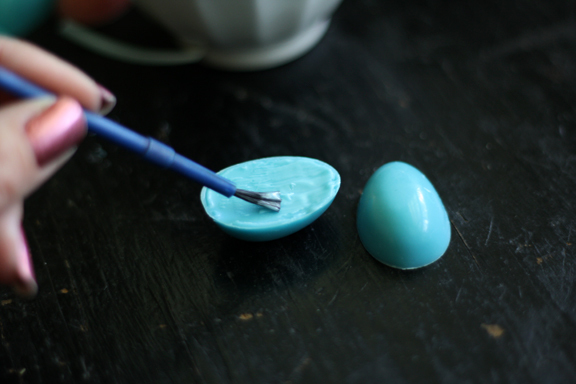 Paint the flat sides of the egg with an even layer of chocolate and put the satin ribbon, shaped as a loop, at the top of the egg. I failed to get a photo of the ribbon so use your imagination. Press the whole thing together and gently hold for a few seconds until the chocolate dries. Don’t hold too long or you will melt the chocolate with your finger tips. Note: I found it easier to make the ribbons into loops and glue ends together with chocolate before I put them in the eggs. In my minds eye, I saw a cute little tree with solid eggs but then I started playing around with easy little embellishments. Like polka dots. I LOVE polka dots! And then some stripes. So cute dontcha think? 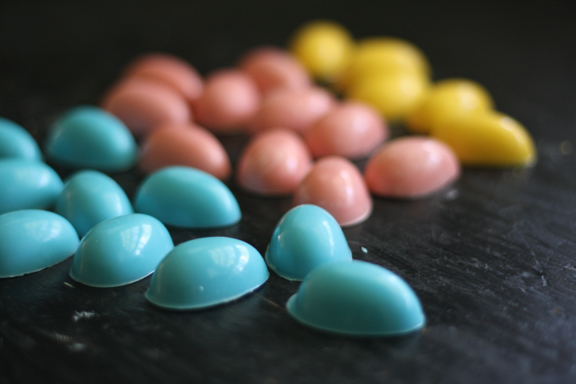 You can make the little eggs as fancy or simple as you wish. I made a few extra eggs that could be used as place cards by painting the initial of each guest on the egg. Just tuck them in a little nest. How cute would that be? Wishing you a Hippity Hoppity Easter filled with love & laughter and some sweet little treats! This is ADORABLE! I love this idea for the centerpiece and for the place cards. This is just adorable! So Springy and cute! These are SO SO adorable!! love it Wendy! Wendy, I just love love love this. 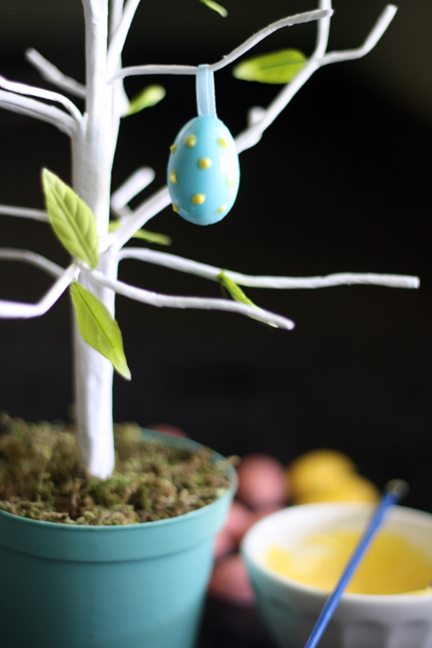 I never would have thought to make edible Easter eggs for an Easter tree. I always admire them in the store, but never bring myself to get one because I don’t see the point of just the ornaments. But if they were edible? YES. Silly delicious! I love it! Adorable!! I absolutely LOVE this idea. Adorable is right! Thanks for sharing, sweet friend. Have a blessed weekend! This is totally adorable! I love it! Oh my goodness! I love this! I simply love it!!! Yeah! What a sweet idea… I love how it looks. I think I happen to have one of those chocolate egg molds hanging around here. Going to go hunt for it! I could not love this more!!! So brilliant Wendy! Wow what a cute idea! 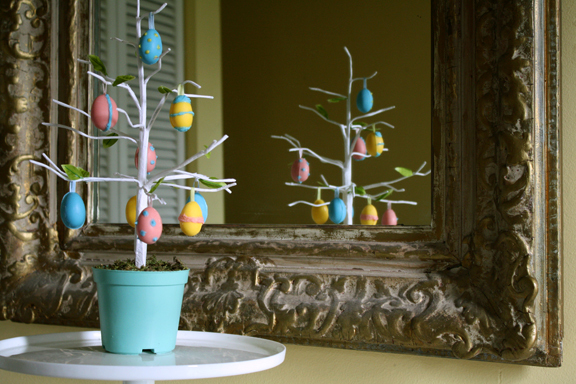 I’ve seen Easter egg trees before, but nothing nearly as cute as this, and definitely not edible. My only concern would be making it last – it would be eaten up at my house the day that I make it! This Easter I made decoupaged Easter eggs it might be a cute idea to try sometime! Thanks for such wonderful posts! Wendy….what a darling idea! And you pictures!!! 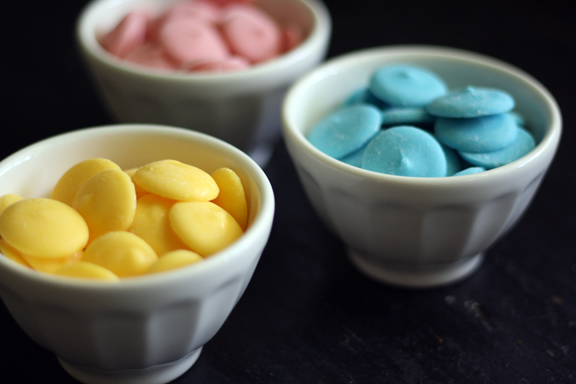 Oh, I love the bowls of candy melts and the stacks of ribbon! So pretty! I just love it, Wendy! How darling!! this is ridiculously cute! i just stumbled across your blog and LOVE it! can’t wait to check out some more of your recipes. became a follower so i could keep up! Crafty…very crafty. These are so sweet–pun intended. Happy Easter, Wendy! One of the CUTEST Easter things I have seen! I LOVE this! Such a cute idea. Egg trees are so pretty—of course they should be edible! That’s adorable, I’m always sad after the Christmas tree goes down that I have to wait a whole year, this is perfect, now I can have an Easter tree! So much fun!! And it’s so pretty, too. My girls would have a blast helping with this! What a fantastic job you did and so CUTE! This is such a sweet (and delicious) Easter decoration. Love the idea using them for name place settings too! The fact that they are all edible make them all the more delightful. Happy Easter! These are so cute Wendy! I’m totally late in seeing these but I have to remember them for next year. My little one’s would love these. Hope you had a super Easter!